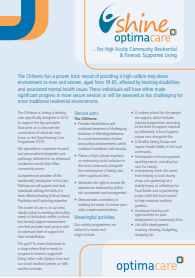 Optima Care supports the Transforming Care agenda, helping people with learning disabilities, mental health issues and complex behaviour move out of secure settings and into the community, improving their quality of life – including enabling their families and loved ones to be much more involved – and reducing the cost of care to Local Authorities. We provide a full MDT-led service, designed to support people out of hospitals and Assessment & Treatment Centres. It starts with a step-down pathway, which aims to give people the choice and control required to make the eventual transition to Enhanced Supported Living, wherever possible. Optima Care’s Shine model of therapeutic care, designed and developed at our flagship setting The Chilterns provides the framework for this pathway: a framework that has been recognised by London-based NHS Foundation Trusts, with whom Optima Care is now working in partnership to provide similar services in the Greater London area. We would be happy to discuss bespoke high acuity community residential services in other areas. Our expertise and experience includes supporting people as they make a transition to Enhanced Supported Living. This service, underpinned by the same Shine principles and MDT input, is focused on giving people as normal a life as possible. It is provided in partnership with our housing partner, independent charity Future Housing Solutions. Our experience shows that living in a community setting not only gives people a much more independent and active life but is also much cheaper than a secure setting. Support needs can be reduced when the right support is given: and that includes better equipping families to be an essential and constant in the lives of their loved ones. Optima Care has established a quarterly Partnership Working Forum to help ensure a smoother journey for all on the pathway to more independent living. At each event, we bring together providers and also community, crisis and forensic teams across the South East with a view to ensuring improved partnership working and consistency in framework support. Recent topics have included integrated funding and legal frameworks.